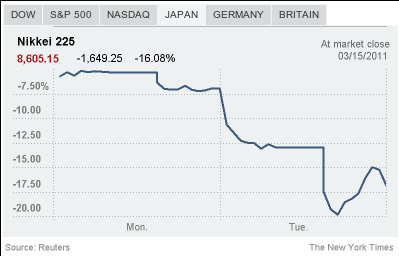 Japan’s earthquake, tsunami and the nuclear accident are “a negative shock to the world economy,” Mr. Chandler said. Analysts said the potential disruption to global economic supply lines in Japan, home to some of the world’s biggest manufacturing and technology companies, could ripple through the economies of other countries, including the United States, and increase the risk of a global slowdown. “Japan’s economic prospects, as the world’s third-largest national economy and fourth-most important international trader, affects us all,” Mr. Weinberg said. That is fortunate, as the US BLS reports "Fuel prices rose 18.6 percent over the past 12 months, led by a 20.6 percent jump in petroleum prices". Oil down 3% - big deal. 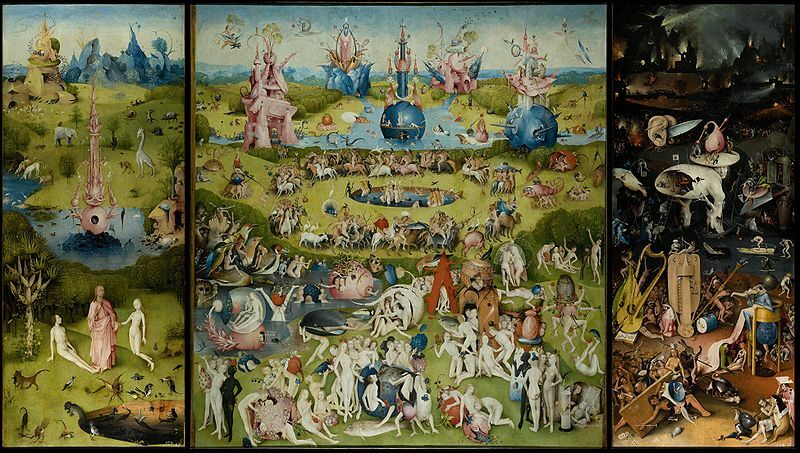 Add all the real market fear and bad economic reality to real rising import and export price news, from the US BLS, to begin seeing the big picture forming ahead, which appears to come stright from the mind of Bosch. Fuel Imports: Fuel prices increased 4.0 percent in February following a 3.5 percent advance the previous month. Rising prices for both petroleum and natural gas factored into the February increase, advancing 3.7 percent and 12.1 percent, respectively. Fuel prices rose 18.6 percent over the past 12 months, led by a 20.6 percent jump in petroleum prices. The price index for nonfuel imports increased 3.6 percent the past year, the largest 12-month advance since a 4.8 percent increase between October 2007 and October 2008. The current 12-month rise was mostly driven by a 12.9 percent advance for nonfuel industrial supplies and materials prices and a 15.8 percent increase for foods, feeds, and beverages prices. Foods, feeds, and beverages prices rose 0.8 percent in February following a 2.5 percent increase the previous month. In February, rising prices for meat, food oils, fruit, and coffee, up 7.2 percent, 5.6 percent, 2.9 percent, and 3.9 percent, respectively, more than offset a 6.4 percent drop in vegetable prices and a 3.9 percent decline in the price index for bakery and confectionery products. All Exports: Export prices rose 1.2 percent in January following a 1.3 percent advance the previous month. The index has risen at least 0.6 percent every month since a 0.2 percent decline in July 2010. The price index for overall exports increased 8.6 percent over the past year, the largest 12-month advance since a 10.2 percent rise for the year ended in July 2008. 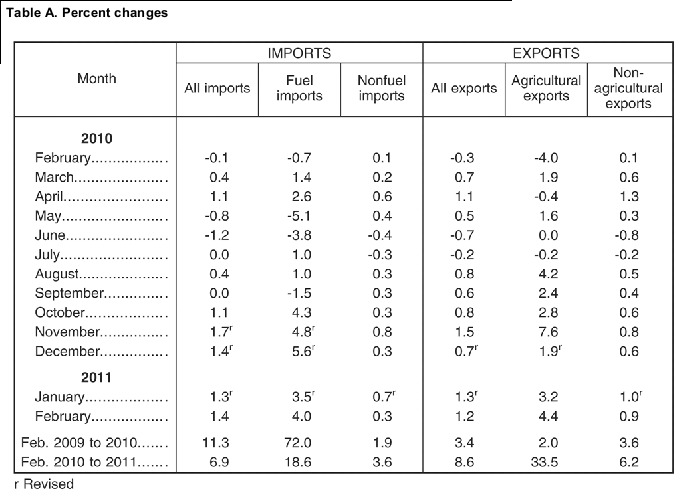 Agricultural Exports: Agricultural exports advanced 4.4 percent in February and 33.5 percent over the past 12 months. The price index for agricultural exports is at the highest level since the index was first published. in March 1985, and the year-over-year increase in February was the largest since a 39.7 percent surge for the July 2007-08 period. Rising cotton prices, up 15.7 percent in February and 153.5 percent over the past year, had the largest contribution to both the February and 12-month advances for agricultural prices. Prices for corn, wheat, and soybeans, which rose 7.9 percent, 11.0 percent, and 3.4 percent, respectively, in February, also continued an upward trend. U.S. import prices rose 1.4 percent in February, the U.S. Bureau of Labor Statistics reported today, following a similar 1.3 percent advance in January. The price index for U.S. exports increased 1.2 percent in February after rising 1.3 percent the previous month. Higher agricultural and nonagricultural export prices each contributed to the overall advance in February. both fuel and nonfuel import prices contributed to the increase in February and over the past year. gas prices declined 10.9 percent between February 2010 and February 2011.
foods, feeds, and beverages prices. All Exports: Export prices rose 1.2 percent in January following a 1.3 percent advance the previous month. percent rise for the year ended in July 2008. February, also continued an upward trend. for the year ended in February. while chemical prices rose 1.2 percent. advance. Prices for automotive vehicles ticked up 0.1 percent in February after rising 0.3 percent in January. vegetable prices and a 3.9 percent decline in the price index for bakery and confectionery products. freight prices advanced 1.7 percent in February, following a 1.6 percent decrease in January. percent jump in steelmaking and ferroalloying material prices. consumer goods prices rose 0.5 percent in February, while prices for automotive vehicles were unchanged. 2011 at 8:30 a.m. (EDT). Submitted by savcash on Wed, 03/16/2011 - 12:58.